Given my previous research into fakers and scammers on freelancing platforms, I’m almost ashamed to admit that I very, very nearly fell for a scam myself recently! This time, however, it was on the holiday apartment rental site AirBnb. AirBnb was founded by some cash-strapped tech guys from San Francisco who started renting out an air mattress on the floor of their apartment to delegates attending Silicon Valley congresses. They built a platform to allow others to do the same, and the idea grew to something akin to a paid-for version of Couchsurfing, where you can rent spare rooms and second homes. Now, allegedly, AirBnb is the world’s largest accommodation booking site, and it’s increasingly used by short-term lettings agencies as well as the more traditional AirBnb ‘hosts’. I’ve used AirBnb loads of times, and have had a fantastic experience each and every time. My husband and I have been hosted by an Emirati property developer in Dubai and an airline pilot in Gothenburg, rented a harbourside apartment in Nice and a casita in the Texan desert. I’ve used AirBnb for business trips, whether alone in a 1-bedroom apartment near to the Minneapolis Convention Centre, or with colleagues in a villa with private pool in Brazil. Most recently, and closer to home, my husband and I and 4 friends rented a beautiful apartment together for a weekend city break in Bath. Fresh from that trip to Bath, myself and the same group of friends are now looking into taking a mini-break in Barcelona – and since we all enjoyed our previous AirBnb experiences, why wouldn’t we do it again? We found this apartment: https://www.airbnb.co.uk/rooms/1025760 – a stunning 3/4 bedroom duplex with a private pool and roof terrace hosted by a lettings agency called Valencia Luxury. Alas, it was much more expensive than any of us wanted to pay. We did think it was a little strange that the same apartment would be listed twice at two completely different prices, but having never had a bad experience with AirBnb before, I trusted the site and wondered if perhaps the same apartment was managed by more than one lettings agency. Also, sometimes larger apartments are listed more than once if the hosts rent out the rooms separately, as well an entire place. Sofie’s listing, the cheaper of the two, contained an email address and requested that anyone interested in booking should contact this email to check availability. My friend did so, and received a prompt and friendly reply asking us to send a contact name, address and phone number, as well as a copy of a piece of photographic ID and a utility bill so as to receive “pre-approval” for the property via AirBnb. They then provided lots of helpful information about how, once pre-approved, the payment process would take place through AirBnb’s secure payment system. FYI, it is forbidden to include contact details in AirBnb listings or AirBnb messages. Click to enlarge and notice that the email address provided here has spaces in it to stop it being automatically detected and removed. I instantly felt very stupid! 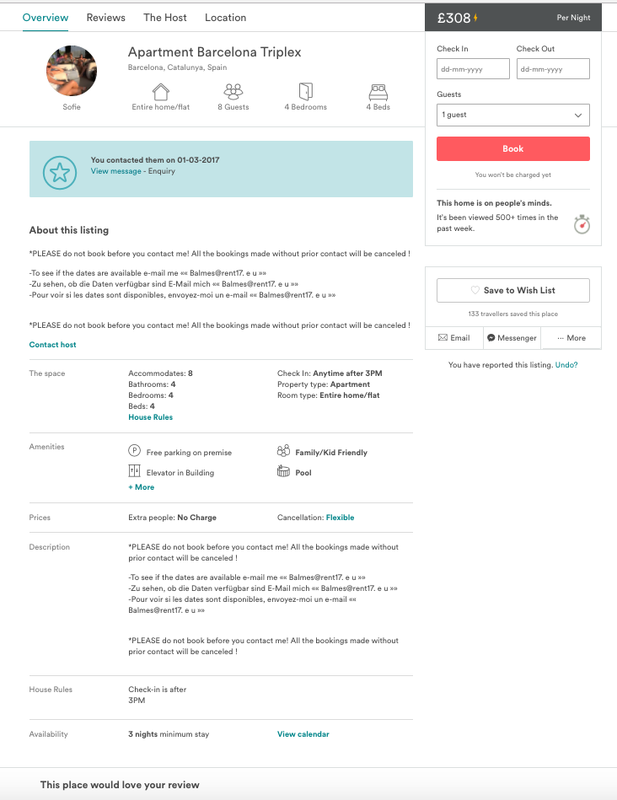 I have a verified AirBnb account, which means that when I submit a booking request through the AirBnb website or app, the host can be assured that I have already provided verified contact details and ID – there should have been no need to send all this information in advance, especially not via email. However, still not quite ready to believe that we were being scammed, I sent a message to “Sofie” via the AirBnb message system, confirming our dates and asking her to pre-approve us that way. Funnily enough, I have not yet heard anything from her. In the meantime, I did some research. Using a Google reverse image search on one of the AirBnb photos, I discovered that the apartment we were interested in is also listed on Valencia Luxury’s own website. 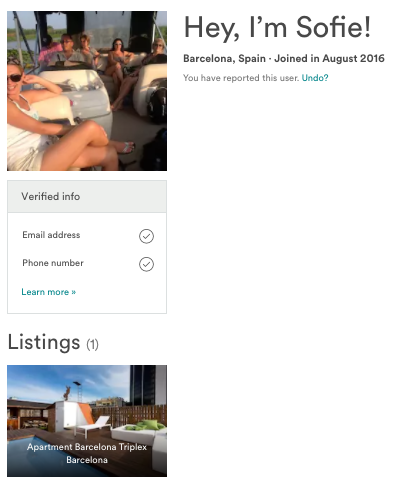 Valencia Luxury seems to be a reputable outfit, with hundreds of positive reviews going back several years, a fully verified AirBnb account, and a 100% response rate to AirBnb messages. Conversely, ‘Sofie’s’ listing gave almost no information about the apartment, other than the same photos as the Valencia Luxury listing, an email address to contact and the message, “PLEASE do not book before you contact me! All the bookings made without prior contact will be canceled!” It also had no reviews. On checking the Who Is record for the domain name of the email address (rent17.eu, FYI – a blank website), I discovered it was only registered in January 2017 by someone known only by a Gmail address (A John Greenwood, not a Sofie). Sofie’s AirBnb profile was only established in August 2016, gave no biography or information, was not fully verified, and she had a dismal 42% message response rate. I messaged Valencia Luxury and they advised me that they are the legitimate owners of the apartment. The other listing, not authorised by them, is indeed part of a scam. Searching online for details of other AirBnb scams, to my surprise (though I’m not sure why it was a surprise!) I found that lots of people have had similar experiences. Here are a few examples reported in The Guardian, The Huffington Post, and this one in The Telegraph, which also concerned an apartment in Barcelona! A common thread running through these stories was that, in each case, the host and guest had been in contact by email. Sometimes, as in our case, the host specified an email address on the AirBnb listing (which I now know is completely against AirBnb’s terms of service), but sometimes the correspondence was initiated through the AirBnb site, with the host later claiming that the message platform wasn’t working so the conversation continued by email. But, in her email to us, why did “Sofie” take the trouble to explain that payment would be conducted via the AirBnb system and harp on about how secure it was? Because, if we had provided the information she requested (which, in itself would give plenty of ammo to use for identity theft! ), the likelihood is that we would have been “pre-approved” via an email purporting to be from AirBnb but with a subtly altered email address. That phishing email would then link to a fake website to process payment….which would not have gone to AirBnb, or secured our reservation on the apartment, it would have just vanished from my bank account never to be seen again. I have loved using AirBnb and this experience won’t put me off using the site, but I will be far, far more careful in future! Here are my top tips for how to spot an AirBnb scam. NEVER EVER contact an AirBnb host via email. ALWAYS use the on-site or in-app messaging system. It can be confusing because if you receive a message via the official platform, you do also receive that message via text and/or email, and you can reply directly to the platform via those emails as well. However, scammers often use fake email addresses that are subtly different from the official AirBnb ones. To be on the safe side, always access and reply to your messages from within your logged-in AirBnb profile, and never click on links in emails – they could redirect you to a very convincing phishing site. Furthermore, it is against AirBnb’s terms of service for the host or the guest to provide their contact details (including email addresses, phone numbers, Skype usernames) before a booking is confirmed, so if a host asks you to email before this stage, it’s definitely dodgy. Check out the host’s reviews. Of course, there are genuine hosts who don’t have any reviews yet simply because they are new, but for the novice AirBnb user, the safest thing is to choose a host who has some history, e.g. positive reviews and a verified account. Better still, some experienced hosts are even awarded “Superhost” status, meaning that they are fully verified and vetted and have received consistently excellent reviews. Check out the host’s profile. Most AirBnb user profiles have a completed biography section in which they tell you about themselves. In our case, “Sofie’s” biography was completely blank. This can indicate a new host who hasn’t filled out their profile yet, but I would argue that if they are serious about listing their place, they should take the time to give you some information. As I’ve found out with freelancing platforms, scammers are often repeat offenders, so if one profile gets closed down, they’ll simply open a new one. Tracking scammers can become a bit like a game of digital whack-a-mole. Check when the profile was created and if it’s very new, has no or a very brief biography, and no reviews, proceed with caution. …Sofie, who has no biography, is not verified, and has terrible response rate and response times. Use Google Reverse Image Search. This is a trick I’ve used a lot to find out whether freelancers’ profile photos are likely to be genuine. Right-click on a photo of the apartment listed on AirBnb. If you’re using Google Chrome, there is an option to directly “Search Google for this image”. If you’re not on Chrome, right-click and select “Copy image URL” (or your browser’s equivalent wording). Then, go to www.google.com/images, click the camera icon on the search bar and paste the URL. Google searches its indexed pages for websites using this image. It doesn’t always return results, but when I did this, I found the apartment listed on Valencia Luxury’s own website, so I knew that *that* listing was the real one. You can also use this trick on the host’s profile picture. Again, it doesn’t always return results, but when I’ve done this with Freelancer profiles, I’ve found that (for example) “Bob Smith’s” photo was actually pinched from “Dave Jones'” Facebook profile, or that it’s stolen from some random website. Be suspicious and ask questions. If, as in our case, you find two similar listings by two different hosts, message both hosts (through AirBnb, of course) and ask them to explain. Apartments can be listed more than once if rooms are rented out separately, and hosts who own similar apartments within the same building do sometimes use the same, or very similar photos to list different properties. However, whole apartments should not appear on AirBnb more than once. When you think about it, it doesn’t even make sense to do this if genuine – why have two listings with an average number of reviews, when you could have one awesome listing with lots of reviews? Anyway, I hope this blog post is helpful! If you have any other tips then please leave a comment below! Great post Lisa! Good tips for air bnb users, so many weirdos and scammers out there. Although I have never had a problem with Airbnb, but I am careful. One host told me his property was was no longer available and sent me an email of what he did have. This was a warning. I agree, read the reviews. Multiple reviews that agree are best. I can appreciate that some travelers may consider sound to be loud, and others will not be bothered. I try, to be honest in my reviews but do not nit pick. Recently we stayed in Greenesboro NC in a good home, but it could use a little cleaning. I stated so along with good items we found there. Thank you for your post, will keep it all in mind. Your welcome Greg, thanks for stopping by my website! I will check out your blog for sure as we’re going to Tuscany in October!